My experience with animal rescue in Louisiana after Hurricane Katrina changed my life dramatically. I ended up bringing home an old lost cattle dog to foster. Our remarkable journey connected me with caring people from all over the world and turned me into an author and independent publisher. 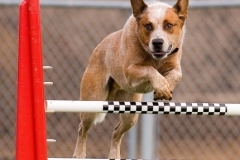 8 State Hurricane Kate: The Journey and Legacy of a Katrina Cattle Dog is our story. 50% of book profits go to the 8 State Kate Fund, named in Kate’s honor, to help animals in need. My second book, the Not Without My Dog Resource & Record Book is the book that I wanted for my own dogs after all that I learned since Katrina. I’m working on a third book, for readers ages 5 to 95. It includes cartoon cattle dogs and rubber chickens, and encourages us to tune in better to the animals in our lives. That’s all I’m saying so far! 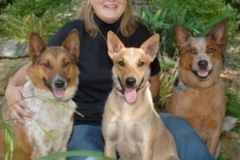 I live in Minnesota with Australian Cattle Dog (ACD) Bandit, rescued ACD-Collie mix Chase, and rescued ACD-Carolina Dog mix Cayenne. One of my greatest rewards has been seeing rescued dogs recover from pasts of abuse, neglect, or trauma and begin to enjoy life. I’ve learned a lot from watching my herding dogs do what they were bred to do. Through working and living with them, I’ve become a better person and a more confident leader. After years of working with my dogs in obedience, rally, agility, herding, carting, tracking, acting tricks, and therapy dog work, with experiences in TTouch, animal communication and more, I’m beginning to feel pretty well trained! My day isn’t complete until I get out for a walk and a ball game with the dogs. 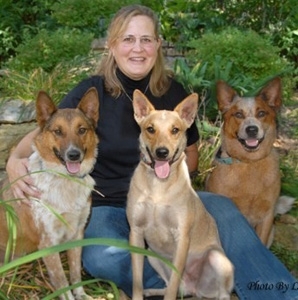 Barbara O’Brien introduced me to Canine Shine® and I’ve been very impressed with how much it has helped my dogs. People even comment on how soft their coats are! 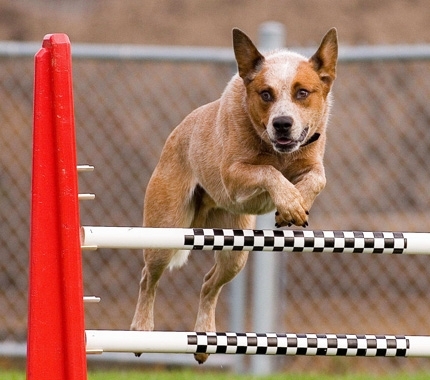 Bandit is a hard-driving herding dog who plays hard every day and also competes in agility. Chase and Cayenne run and play hard and like to attend book events. Cay had terrible itchy skin when she first came here and her skin and coat have improved so much. Although all three dogs were on high-quality grain-free food already, they benefit from the extra nutrition provided by Canine Shine®.